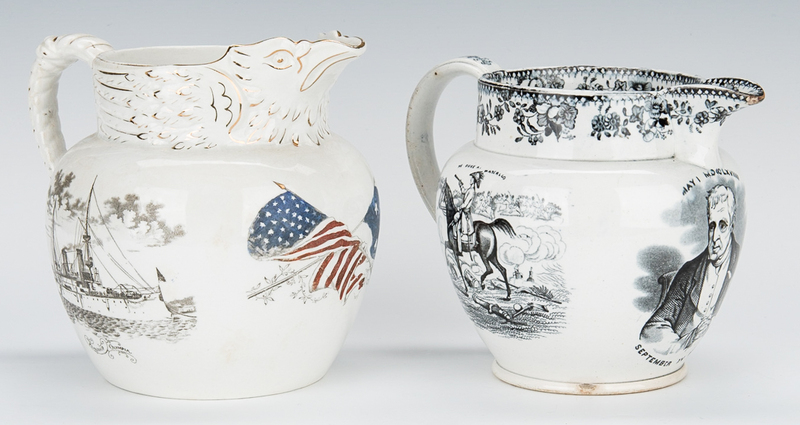 Seven (7) Historical Transferware Pitchers, including Staffordshire and Trenton; subjects include Spanish American War, Waterloo, Farmers Arms and English Royalty. 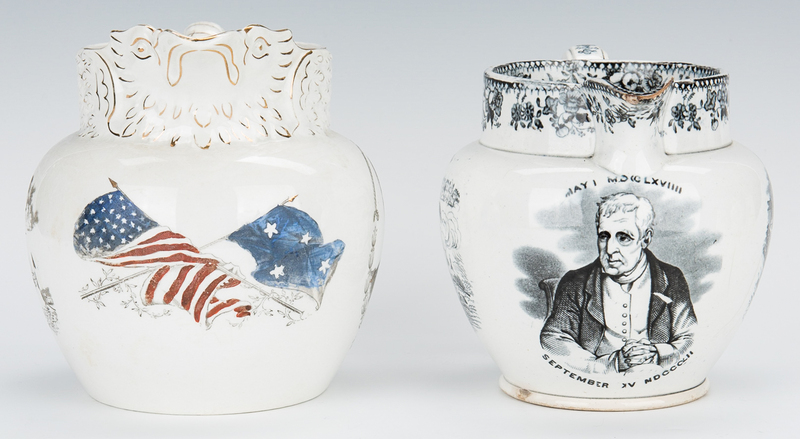 1st item: Spanish-American War commemorative ironstone pitcher, molded with an eagle's head-form spout and flaring wings, rope twist style handle; black transfer-printed cartouches of Admiral George Dewey within a rope twist and laurel wreath border on one side and the battle Flagship Olympia on the other side; American flags crossed and painted in blue and red enamels under the spout. 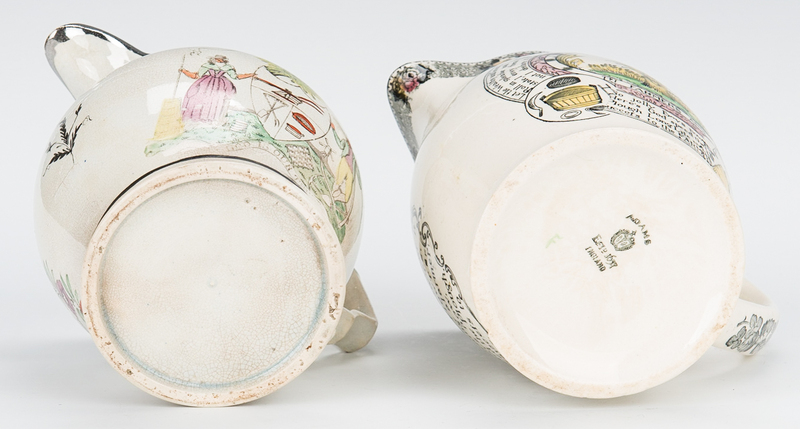 Marked on underside: The Cook Pottery Co., Trenton, NJ and date 1899. 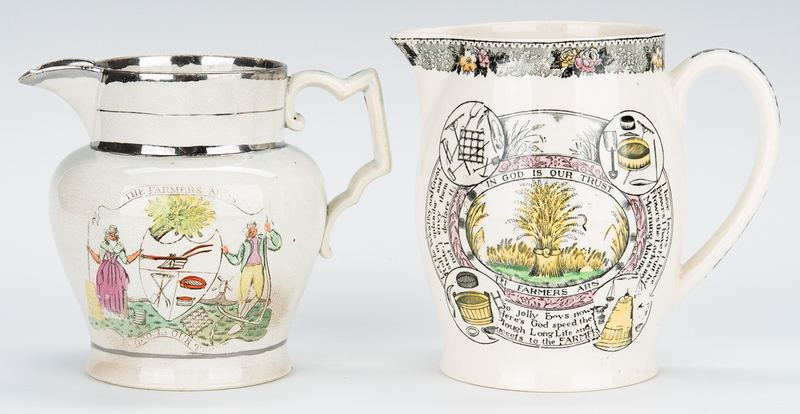 6 1/4" H. 2nd item: Staffordshire transferware jug with vignettes of The Duke at Waterloo and Walmer Castle, Kent, to the bulbous body; floral design to rim and handle. Unmarked. 5 1/2" H. 3rd item: English mulberry Staffordshire cream pitcher commemorating King William and Queen Adelaide, Crowned Sep. 8, 1831. 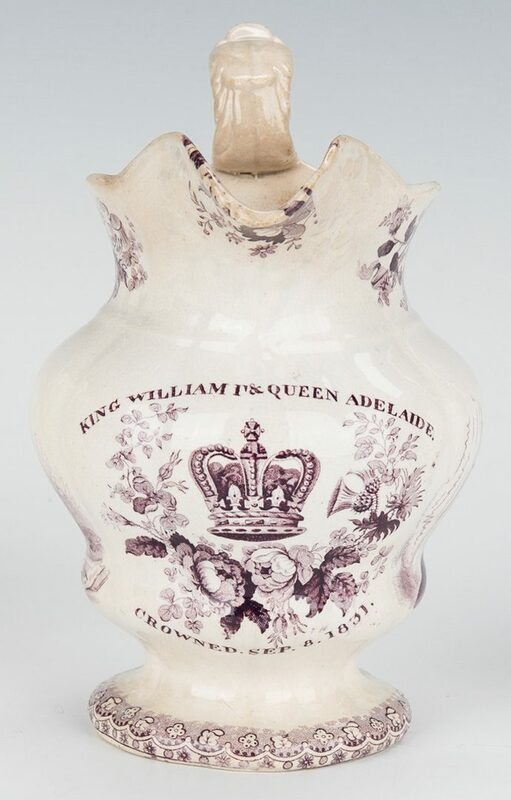 Scalloped rim, molded foliate patterns under spout; lobed, double globular waist above a rounded foot, with portraits of "Most Gracious Queen Adelaide" and "His Most Gracious King William". No maker's mark. 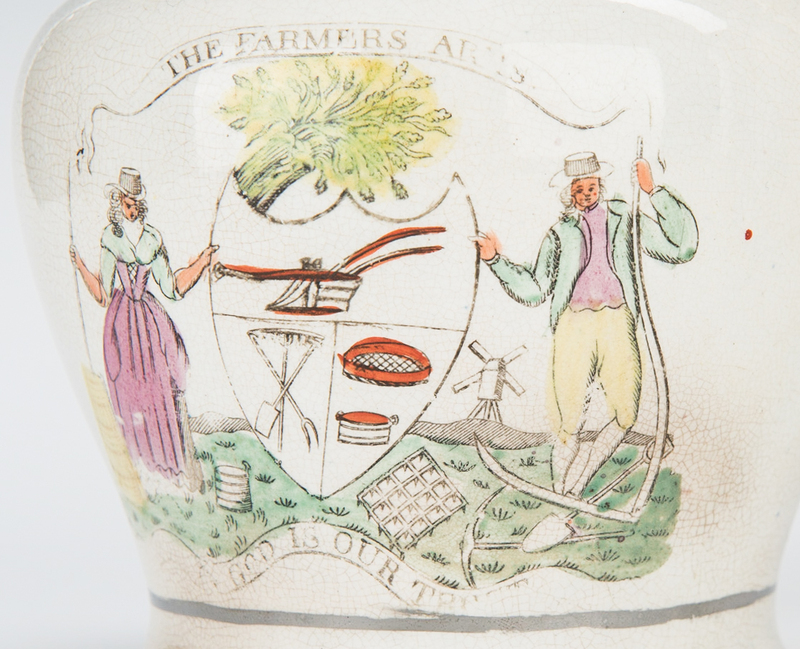 6 1/8" H. 4th item: THE FARMER'S ARMS pearlware cream pitcher with silver luster and polychrome transferware decoration; silvered rim over a bulbous body decorated with transferware male and female figures surrounding a shield, decorated with wheat and farming implements; the reverse side with verse: "Success to the Plough, the Fleece, and the Pail; May the Landlord ever flourish and the Tenant never fail." No maker's mark. 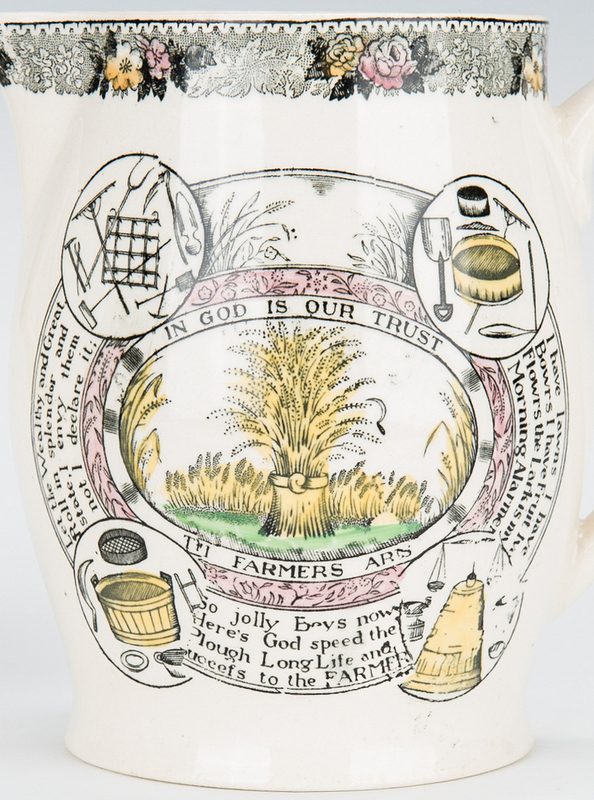 4 5/8" H. 5th item: THE FARMERS ARMS polychrome transferware pitcher or milk jug, floral border over vignettes of farm implements surrounding a motto "In God is our Trust" and verse; longer verse on opposite side within a cartouche featuring various farm tools. Adams England mark to underside. 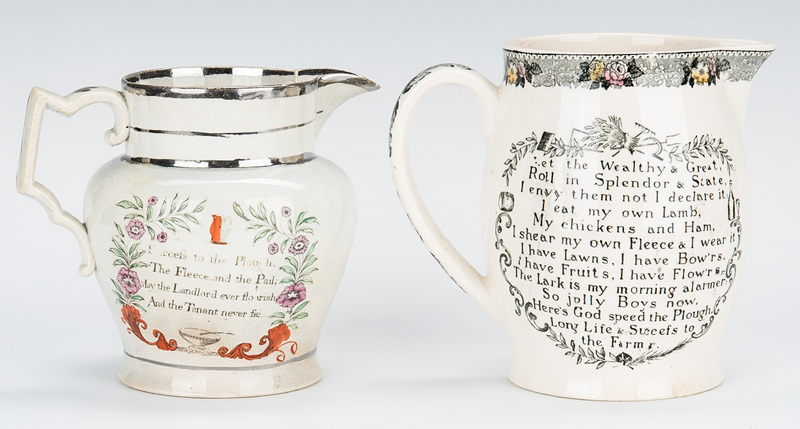 5" H. 6th item: Small creamer with transferware portrait of poet John Greenleaf Whittier and his birthplace, Haverhill, Mass. 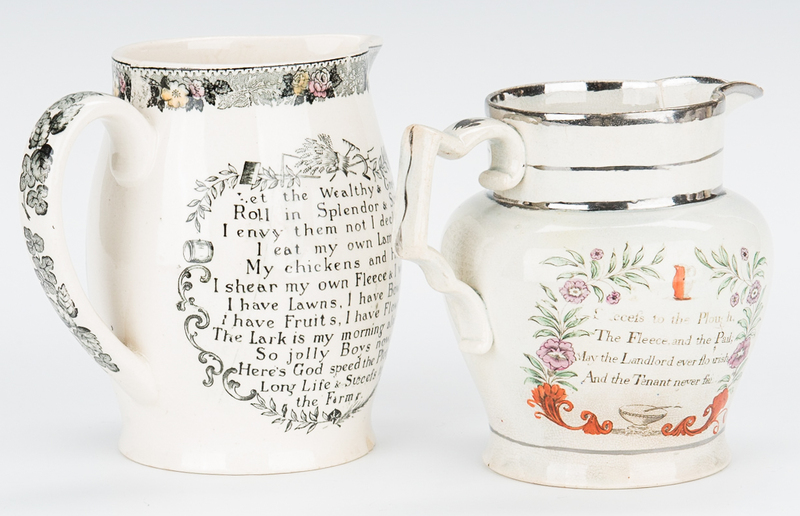 ; additional verse "The mug of Cider simmered slow/ the Apples sputtered in a row". Mark for Chas. 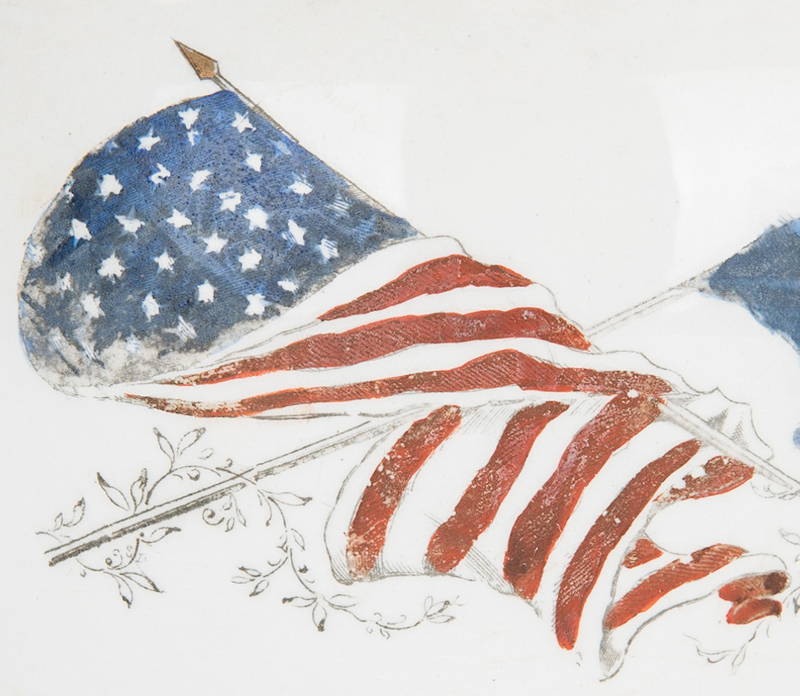 Emerson & Sons, Haverill, Mass and "England" on underside. 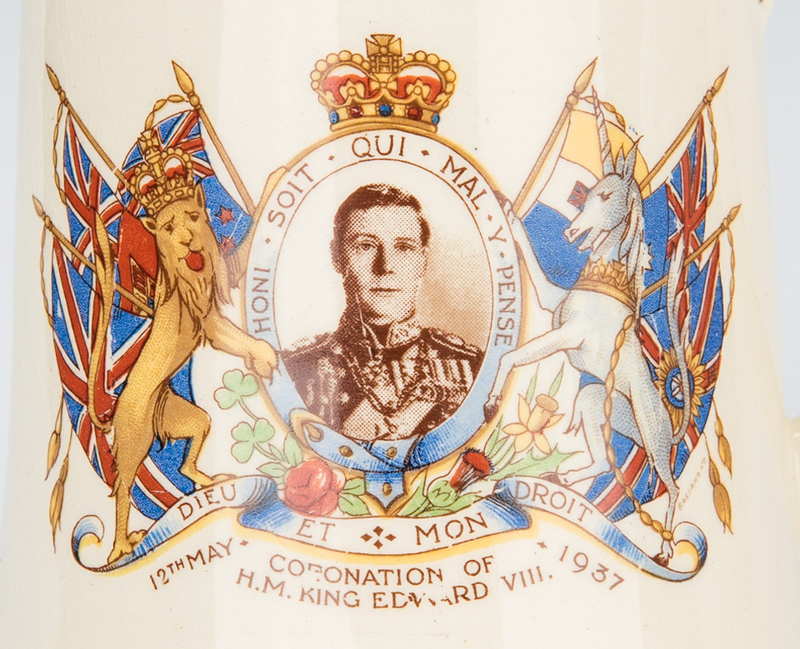 3 3/4" H. 7th item: Pitcher commemorating the coronation of King Edward VIII, May 12, 1937 with polychrome royal coat of arms and gilt trim on a tapering rounded body. Empire England mark to underside. 4 3/4" H. CONDITION: 1st item: Wear to gilt, overall crazing . 2nd item: Three 2" hairlines to body, 1/8" chip to foot, 1/8" chip to spout with some staining. Overall light crazing. 3rd item: Crazing and staining to interior, light crazing to exterior. 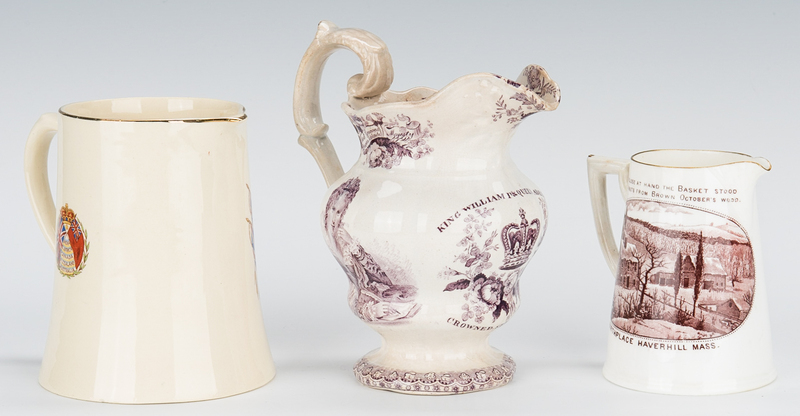 4th item: Light crazing and some wear to decoration. 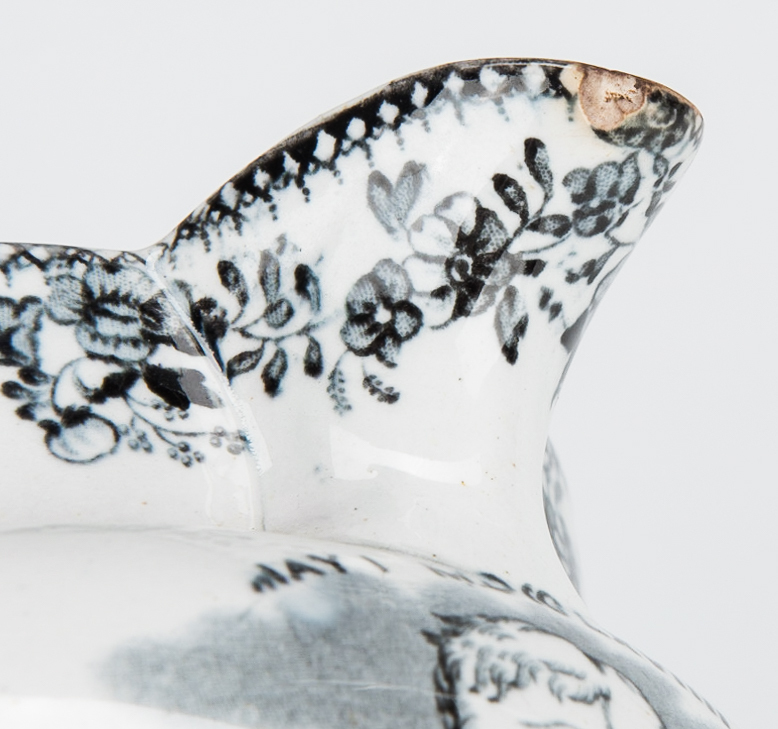 1/8" chip to spout. 5th item: Light crazing to exterior, more significant crazing and staining to interior. 6th item: Excellent condition. 7th item: Scattered crazing.